Meet Spot, the world’s first fully functioning robot dog created by Boston Dynamics. Just like regular dogs, Spot can run, walk, and play fetch. But like a robot, Spot can climb up hills, long staircases, and uses a sensor located in its head to walk through rough and rugged terrains. One could probably refer to it as a ‘Terminator’ dog. Spot is roughly the size of a grown St. Bernard, and, at 73 kilos, is twice as strong as one, too. This was proven when a man once kicked the robot while it was trotting down the hallway of a building – It barely moved. Later on, Spot experiences another stronger kick while walking across a parking lot. And instead of malfunctioning, it simply slips down and backs away as it tries to stand again. Spot can move its legs with the help of some hydraulic actuators. As it walks, these actuators produce a whirring noise, which has an uncanny similarity to the whining noises that real-life dogs usually make. Aside from the aforementioned sensors, Spot’s head also comes with a spinning cylinder. This isn’t the first time that Boston Dynamics has created a robot dog – Before Spot, the robotics company has made a bigger four-legged robot called LS3, which is built for use in the military. Just like Spot, LS3 can also walk across rough terrain and assist soldiers in carrying up to 400 pounds of gear. 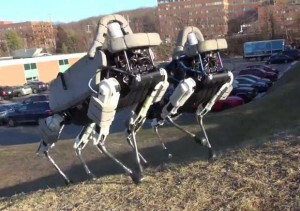 Other robots from Boston Dynamics include the cheetah-like Wildcat, and the Sandflea. The Wildcat is known as the world’s fastest robot, which can go for up to 28.3 mph. Meanwhile the Sandflea has the ability to jump for up to nine meters – The height equivalent of a three-storey building, and land on the hard ground without any damage. 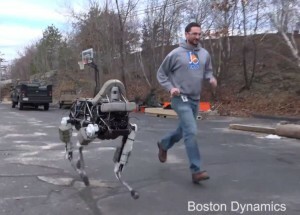 Boston Dynamics, the company behind this whole menagerie of robotic animals, was purchased by Google in December 2013 and is currently managed by Andy Rubin. The Defense Advanced Research Projects Agency (DARPA), a US agency that handles the technology used by soldiers in the military, also largely funded the Spot project. DARPA is handled by the US Department of Defense. Even though Boston Dynamics has been sharing their progress when it comes to making robots, the public has yet to find out the purpose behind Spot’s creation. But its agility, size, and ability to self-stabilize make this one of the most capable robots that Boston Dynamics has made so far.